Being a graphic designer has it's ups and downs, just like any career. You deal with some great people and some not so great people. You get people who respect what you do and others who think you're just pushing buttons. Even after 14+ years of experience, I still get the occasional inquiry that makes me shake my head. Like today, I received an email with a logo request which started with the guy setting the price for the project, and ended with me rolling my eyes. 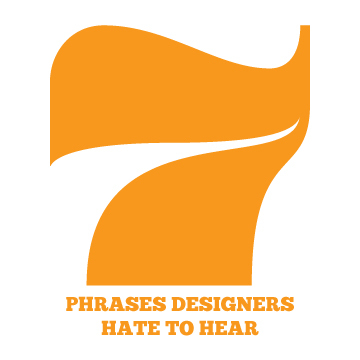 So I compiled a short list of the phrases we designers hate to hear. Below each phrase is what we would love to say in response, but most times bite our tongues. Can you make the logo bigger? We need to make it pop so people can see it. Sure, let's bypass the content on your website and stick a big fat logo up there so people can see how insecure you are. That's expensive. Can you do it for half of that? No problem, I didn't want to pay my mortgage this month anyway. I'll let my Wife know were moving into a cardboard box. It's an easy one, so it shouldn't take you very long. You're right, I'll get this done asap since there's no skill in what I do. I'll just call all my other clients and tell them to hit the bricks while I work on your project. I don't know exactly what we need, but we need something cool. You're really lucky I just learned to read minds. This won't be a problem at all. Can I show this to my daughter? She has a great eye for this stuff. Yeah, of course, because you don't hire a professional graphic designer with a decade of experience and NOT ask your daughter, the nutrition major, for her advice. We don't have the copy yet, but we can get started on the design. That's an amazing idea. I'll just imagine what the copy will look like and lay out the images and graphics in random sizes. If the copy is too much I’ll just remove random sentences and images until it all fits, and if you give me too little I’ll just fill the space with sentences of how awesome you are. I can't afford to pay you now, but if we can do it for free this time, I will definitely spread the word. I got lots of connections. Yes, no problem. My Wife and I got tired of eating so this works out great. It's worth the risk because your vast network will surely elevate me to fame and fortune. It's clear that even though you can't afford to invest in your own business, I should be taking any and all business advice from you. Now, can I wash your car? What do you think of this list? Did I leave anything out? Are you guilty of some of these? 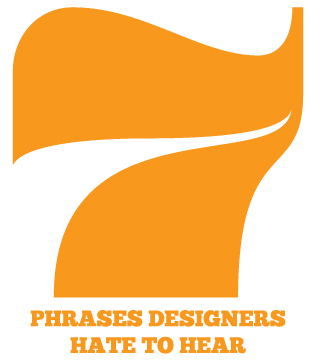 Leave us a comment and let us know what you'd add or which is your most hated phrase. Share on Facebook and Twitter and use @salvatier! Thanks for reading.